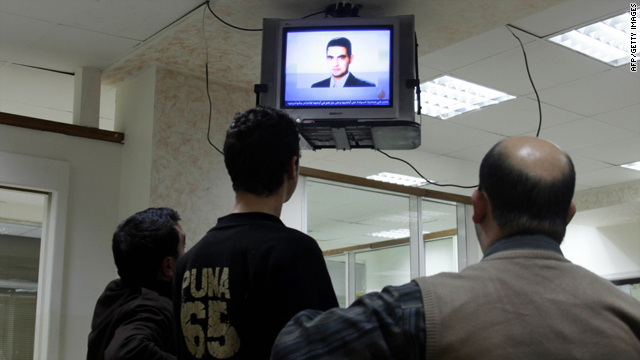 Employees look at a picture of Jordanian Humam Khalil Abu-Mulal al-Balawi broadcast by the Qatar-based Al-Jazeera satellite news channel at an office in the Jordanian capital Amman on January 6, 2010. (CNN) -- Al Qaeda has claimed responsibility for the suicide bombing in Afghanistan last month that killed seven CIA employees and contractors and a Jordanian military officer, according to a statement posted on Islamist Web sites. The December 30 blast at a U.S. base in Khost, in southeastern Afghanistan, killed seven CIA operatives including two from private security firm Xe, formerly known as Blackwater. The eighth victim was Jordanian Army Capt. Sharif Ali bin Zeid, a cousin of Jordan's King Abdullah II. Jordanian and U.S. intelligence agencies apparently believed that al-Balawi had been rehabilitated from his extremist views and were using him to hunt Ayman al-Zawahiri, al Qaeda's No. 2 figure, the former intelligence official said. The al Qaeda statement posted Wednesday identified al-Balawi as Hamam Khalil Mohammed Abu Malal, who used the name Abu Dujana Khorasani. It said Abu Dujana was a well-known Islamist author and a preacher on jihadi Web sites, an immigrant for his faith and a fighter who sacrificed himself and his money for his God and belief. "May God accept him as a martyr who was able to infiltrate the Americans' forts," the statement said. "We ask God to bless the people who follow your path, Abu Dujana," it said. "Let them know that your brothers are following your path and they will not have peace of mind until they slaughter the Americans and let the Islamic nation be proud for having men like you among its sons." Several groups have claimed responsibility for the attack, one of the worst blows ever to America's intelligence community. Some analysts said that militant groups may be competing for credit to spread the word and attract fresh donations and recruits. In a posting on its Web site last week, the Taliban in Afghanistan claimed that the bomber was an Afghan National Army soldier. On Sunday, however, Pakistani Taliban chief Hakimullah Mehsud said in an e-mail that his arm of the Islamic movement carried out the attack, also citing the reason as revenge for Baitullah Mehsud's killing.